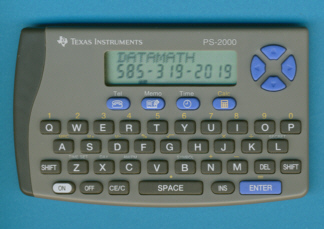 The PS-2000 Databank stores 50 names and numbers in a credit card sized housing. The PS-2000 was the first Databank assembled in China, contract manufacturer was Nam Tai Electronics, Inc. The display of the PS-2000 consists of one line for alphanumeric characters and one line supporting only numbers. The PS-2100+ packaged in the same housing added 2k Byte memory keeping track of 150 names and numbers. The design of the PS-2000 fits neatly with the PS-2400+. Don't miss the colorful PS20/20.